A selection of my animal portrait prints will be included in the group exhibition at the prestigious AIPAD Photography Show in New York City, from the 14th to 17th April 2016, and includes the new, larger 30″ x 30″ framed print of the award-winning “Lion’s Stare”. The Weston Gallery booth also includes prints by Ansel Adams, Robert Weston and many other artists. 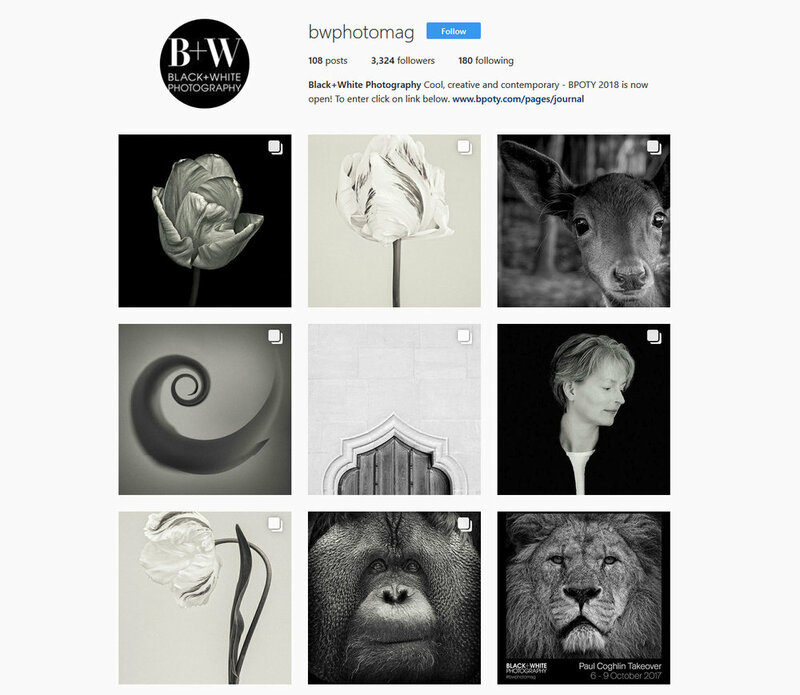 “Celebrating its 36th year in 2016, The Photography Show, presented by AIPAD, will be held in Manhattan’s Upper East Side at the Park Avenue Armory, with more than 85 of the world’s leading photography art galleries exhibiting”. I was delighted to see my work featured in Rise Art’s “Styling With Art” series. My “Two Elephants” print was chosen “for its charming intimacy, sharp detail and pleasing symmetry”, around which a room was styled, based on the theme of travel photography. Rise Art wanted to “reflect this sense of comfort while also bringing a touch of exotic” and that the print would accompany a casual living space. Thank you Rise Art for selecting one of my prints. I’m very pleased to announce that the UK’s Royal Horticultural Society, the RHS, have selected my work as part of this year’s London Shades of Autumn Show, on between 22nd and 23rd October 2013. Twelve prints from my fine-art “Petalum” series will be on display at the Show, which celebrates all things botanical. The RHS holds a wide range of large-scale flower shows around the UK each year and the London Shades of Autumn Show will also be featuring show-gardens, trade-stands, nurseries, presentations and exhibitions. RHS Horticultural Halls, Westminster, London SW1P 2PE. For further details, please visit the show’s website. 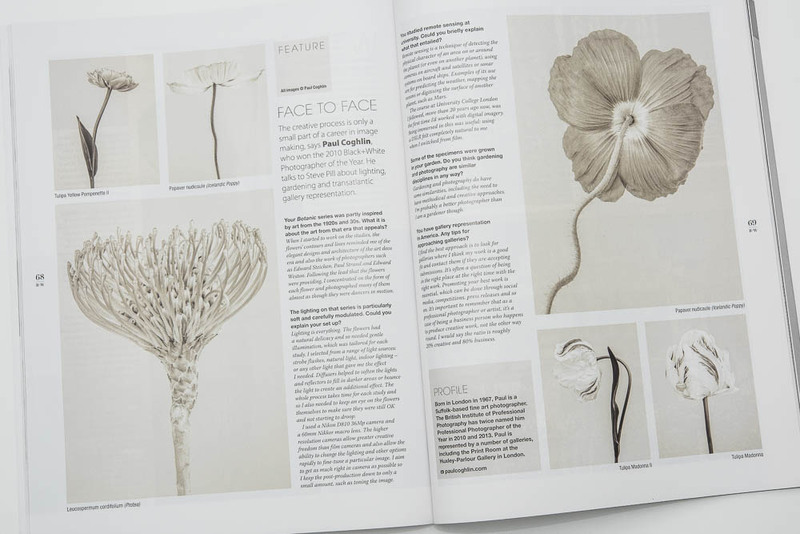 The March 2013 edition of Photography Monthly magazine has a five-page interview feature on “Petalum“, illustrated with many images from the from the thirty-print botanical series. 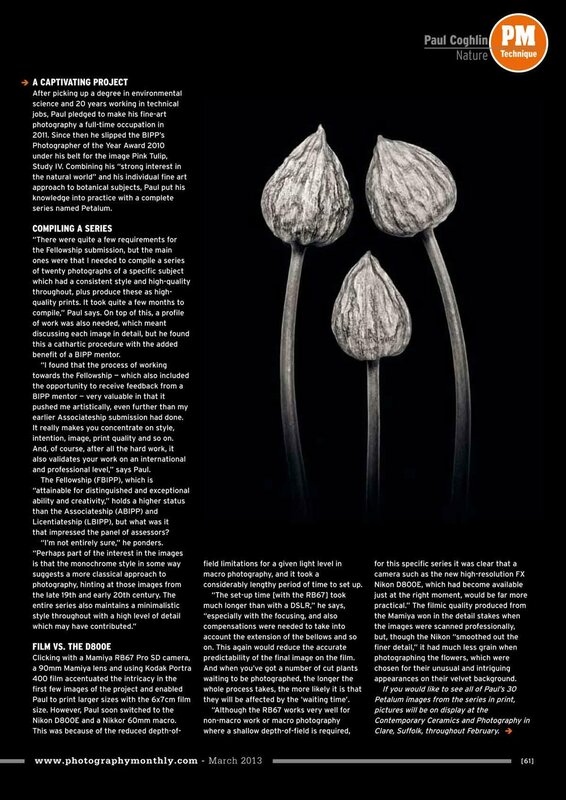 In addition to the flowers, the article also includes a number of my personal favourite images from recent years. Please click on the images above to read the article. Platinum/palladium prints of two of my animal images have been featured in the latest edition of “The International Journal of Contemporary Photography”, aka “Silvershotz”, in an article by David Chow, along with platinum/palladium print reproductions of work by Rankin and Damien Hirst, Wendy Bevan, Stefan Milev, Simon Larbalestier and other artists. To view the article, in Volume 8, Edition 4, please click here.